Heading into last night’s Academy Awards ceremony, I was fully prepared to write another glowing column about “La La Land,” raving about the film’s actual merits on a night that felt like Damien Chazelle’s masterpiece was going to be picked apart by fans of other nominated films and later derided as “not a good Best Picture winner” by those who actively dislike the movie. 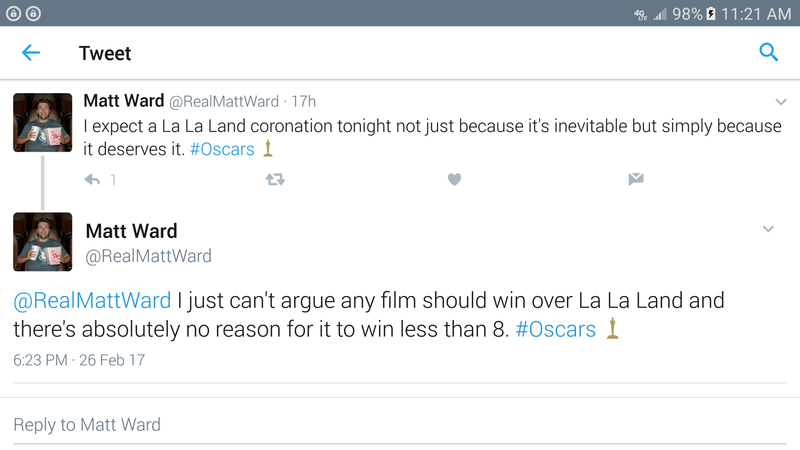 Today, less than 24 hours after the Oscars, I still can’t find any reasonable argument that “La La Land” wasn’t the best cinematic experience of 2016, the perfect blend of commercial success and critical darling that we as moviegoers deserved to see win the Academy’s top prize. The fact that it tied with “Titanic” and “All About Eve” for the most nominations ever (14) or that it’s the 11th film in history to win six Oscars feels hollow now. And it’s not because of anything “La La Land” did or didn’t do or that “Moonlight” won Best Picture, signaling a whole new era of small, intimate independent filmmaking taking major strides forward in how we view quality cinema. I’m sad today because of the perception “La La Land” is left with – the “Yeah, but…” cinematic footnote it’s become and how it will be forever remembered in trivia lore as the only film to start accepting a Best Picture Oscar it didn’t actually receive. I’m hoping I can watch “La La Land” again without the mental stain I feel right now, without constantly second-guessing every note and line, every camera angle and lighting choice, every dance move and time cut, the Best Picture “what ifs.” Because I don’t know that I can. Because of my unhealthy obsession with Chazelle’s films, I saw “La La Land” in theaters seven times over the course of a month, finding something unique and new each time I watched it. I fell in and out of love with Emma Stone’s Mia (the character, not her Oscar-winning performance) as I found myself connecting with Ryan Gosling’s passionate Sebastian more and more with each viewing. I took note of all the little details he remembered about her life, how unwavering his support of Mia’s acting was and how devastating it was to watch him sacrifice himself for her so she could be truly happy, even if it wasn’t with him. With the help of the “La La Land” soundtrack on heavy rotation, I learned greater appreciation for the film’s much beleaguered musical numbers which suffered from poor sound mixing that muffled the live vocal track with the instrumental track and rendered much of the film’s dazzling opening number “Another Day of Sun” indecipherable. By viewing five, I was singing along with Seb and Mia during “A Lovely Night” and the Oscar-winning “City of Stars” because I simply couldn’t help myself. I grew to love composer Justin Hurwitz’s orchestral score more and more as I kept hearing each of the film’s major themes in small, intricate background moments that underscored the film’s bold lead acting performances. The soft guitar rendition of “City of Stars” mellowing out Mia and Seb’s first date on the Warner Brothers lot, the Lighthouse Café jazz band playing “Another Day of Sun” in blistering fashion, the musicality of “La La Land” hits you in waves you simply just can’t appreciate in one screening. Chazelle more than earned his Best Director Oscar with a wonderfully composed film that exudes technical craftsmanship, attention to the smallest detail and celebration of the human spirit. Just watch the six-minute segment including the terrific song-and-dance number “A Lovely Night.” Shot all in one take on just the fourth try, Gosling and Stone carry on a flirtatious conversation along a dark street, sing a surprisingly challenging song live only to break out in a complicated two-minute dance sequence and head back into normal conversation without stopping. The technical precision involved in pulling off this cinematic feat is incredible, especially when you consider how Oscar-winning cinematographer Linus Sandgren was following the pair around the entire time on a crane. Cinema this good shouldn’t be possible. And yet somehow it is. Perhaps the smartest thing Chazelle did in “La La Land” – better than any camera movement or line of dialogue – was in casting top-notch actors rather than top-notch singers to bring Sebastian and Mia to life. At the end of the day, “La La Land” is as much a nostalgic, romantic drama as it is a movie musical, if not much more so. Remove the big dance numbers at the top, “Another Day of Sun” and “Someone in the Crowd,” and what you’re left with is still one of the three best films of 2016 that focuses more on the concept of following your heart or following your dreams and how difficult choosing one over the other might be. Singers who might have been able to project “City of Stars” and “A Lovely Night” better, those who could belt the high notes with the best of them, could have made “La La Land” a prettier sounding musical than the grittier, flawed soundtrack the film ultimately has. But there’s so much beauty within the flaws of Seb and Mia’s singing that help develop actual character and authenticity in the film. Broadway singers could not pull this off. Their tone may be flawless, but the film’s tone would ring false. Somehow, six Oscar wins and 14 nominations don’t feel like enough for “La La Land,” a film so special on its own merits that the irrational need for some to tear down “La La Land” as a means of lifting up “Moonlight” feels incredibly disingenuous. Both films are terrific, but “La La Land” stands out more for what is actually on screen, rather than what it represents as part of an ongoing cinematic and political narrative. It’s frustrating to see one of my favorite films this decade get caught in the middle of the crossfire. 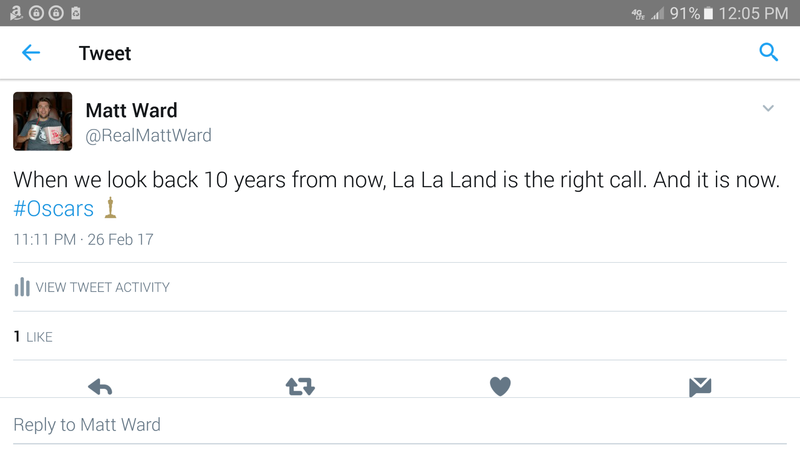 “La La Land” is a nearly flawless film. One award show miscue cannot change that.